Within walking distance of the University of Texas campus, St. David's Hospital and a wide variety of restaurants, our studio is located in a free-standing building behind our house. Our quaint neighborhood is in an older section of town, and is remarkably quiet for its central location. A longer walk or a short cab ride takes you to the State Capitol, downtown Austin, the Convention Center, the hike and bike trail, Barton Springs and many music venues. The studio was designed by a prominent local architect, and has an open, airy feel with abundant natural light. 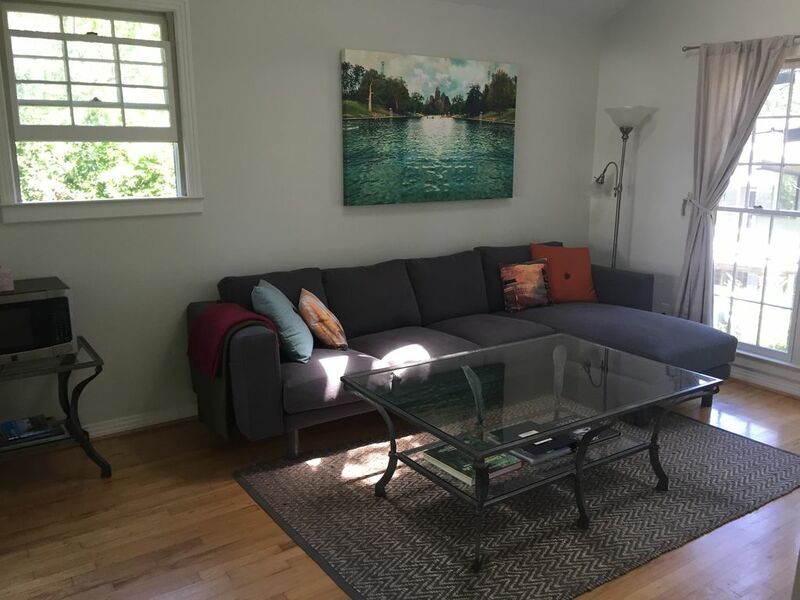 The living area is furnished with a comfortable sofa and loveseat, and the bed, made by a local artist, is spectacularly comfortable and outfitted with nice linens. There is a loft accessed by a ladder from the main room in which younger kids or teenagers can sleep. The kitchen area has a stove/oven, a small refrigerator, a sink/garbage disposal and a coffee maker. There is a flat screen TV with DVD player that can be viewed from the living area or bedroom. There are also French doors that open onto a small balcony/deck with relaxing patio furniture. A guide book provides information on local eateries and activities. We have lived in Austin for many years and are thrilled to have found such a great city with many opportunities. We enjoy outdoor activities and the live music scene Austin has to offer. We are happy to help plan your vacation in Austin as we have lots of suggestions for a wonderful time. While staying at our property, you can enjoy the convenience of walking to University of Texas campus or to St. Davids hospital. We have many eclectic restaurants within walking distance from the property. Most guests comment on the privacy they enjoy while they are here. The neighborhood is pedestrian friendly and guests enjoy the proximity to the city. Additional linens for long term stays. Living room and kitchen area combined. Best table for dining is on outside porch. Dining also available from sofa/loveseat using coffee table. Laundry room is also kids playroom. Kids are welcome to use toys in playroom. Available to share with homeowner. Vaulted ceilings, stained glass, skylights, ceiling fans, hardwood floors, and fantastic backyard/garden. The restaurants and bars on Manor are an easy walk from the studio. Comfy queen size bed in its own nook, full size fridge in the kitchenette, lovely breakfast area on the porch, all 1 flight upstairs, with a view of the yard, main house, and the street down the tree-lined driveway. A/C with its own thermostat. Kind, responsive hosts, happy to be of help. About a mile from downtown Austin (lots to see, do and great music to hear and dance to), but quiet and tranquil. Would stay again. I was impressed by this little condo! There is a well-compiled welcome notebook with a list of instructions for the studio, as well as menus for restaurants in the area. The cupboards are full of "real" dishes, and the silverware drawer had durable eating utensils. There are nice towels in the bathroom, as well as a blow dryer. They allowed us to use their laundry facilities, and we were grateful for it. We were also grateful for the use of their hot tub. I was able to speak with Lanny a few times, and meet Kim once. They were away on a family trip during part of my stay there, so I felt a little worried if something major were to happen. That's just me, though. It would have been a better experience if the light over the balcony had worked, not only because I like to stay up and read, but because the mosquitoes like to snack on my husband. Also, be prepared to carry your luggage up a couple of short flights of stairs. The bed was on the decidedly firm side. The thermostat is sensitive, but if you have problems cooling down, run the ceiling fan over the bed since there is an open loft overhead. All in all, the positives outweighed the negatives, and it was fine for two people. It's conceivably big enough for three, but if you have any strength of personality among the three, someone needs to book a hotel. We loved our stay in the tree house. It was clean & well stocked with everything we needed. We enjoyed the neighborhood and it’s close proximity to everything we were there to do. Kim and Lanny are great hosts. We’d definitely stay again. Great place, clean, comfy and well-appointed, located in a nice little neighborhood with restaurants nearby, walkable to UT. We took the bus almost everywhere (a great deal) -- there are several stops within a few blocks of the house. Host Kim was the perfect blend of helpful and friendly without being overbearing. We would definitely stay here again! The Treehouse Studio was a great place to stay during our visit, clean, comfortable and spacious. Kim and Lanny were great hosts. The location worked well for our visit, with interesting restaurants and bars within walking distance and just a short drive to downtown, E Austin and other areas of interest. Thanks for a great stay! University of Texas campus, St. David's Hospital and wide variety of restaurants within walking distance. Rates are subject to change until reservation is confirmed. Rates and minimum stay may increase for certain weekends (SXSW, ACL, etc).